I’m usually not drawn to girly fabrics…but I JUMPED at the chance to sew with these when I saw them at Quilt Market. The line is Flirt by Dear Stella and the colors are perfect. I love that these fabrics work equally well for a baby or a teenager. So you can make a baby quilt that they won’t outgrow it in a year! With that stack up there I made a baby quilt using my Playful pattern. The different pinks work so well together. I quilted it with diagonal straight lines, and machine bound it using this method. After a quick wash and dry it’s ready to deliver to a new baby girl! Flirt is in stores now. These photos don’t do this fabric justice! oh yes they do! i love this quilt!! that playful pattern really makes these fabrics stand out!! I'm not usually drawn to pink but these fabrics are lovely. I need to make my 12 year old daughter a new quilt. I'm at the looking at fabrics stage and I think those pinks might be contenders. Super cute! 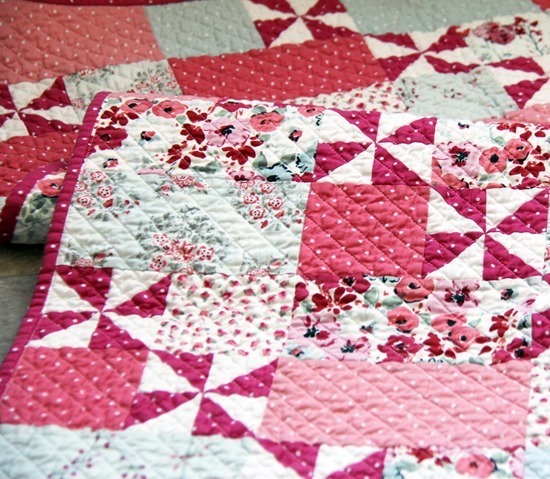 Those pinwheels are great – love your pattern. Im not a pink person either but I love a pinkish red; it's a little sweet and a little sassy! The colors are gorgeous and that pattern is perfect for it. Love it! This is a great design with the pinwheels and bricks. I can imagine it would show off a lot of different collections. Great job! Just beautiful! Is this fabric out yet and I may just have to buy this pattern! I love it. I need to make a little girl quilt and this pattern and fabric would be perfect! Such a pretty quilt! I don't see a lot of gray with pink but I think it looks just so beautiful. 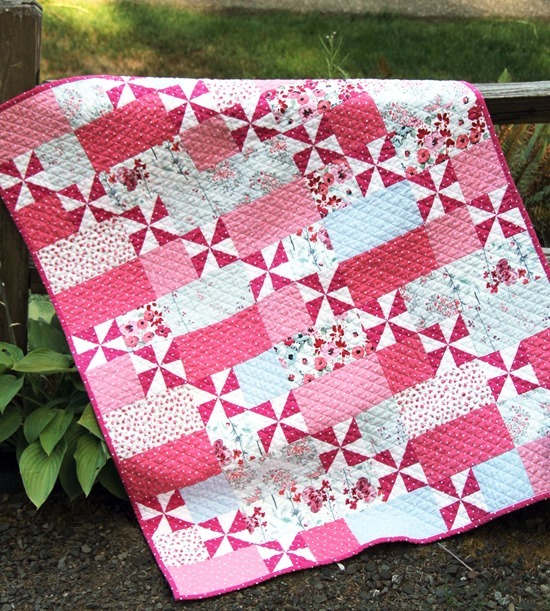 Your pink playful pattern quilt is adorable. I love that fabric collection. With all boys in my house I usually stay away from pink too, but this is one I must consider! The fabrics are adorable especially because they do not scream baby, but are just feminine and pretty. 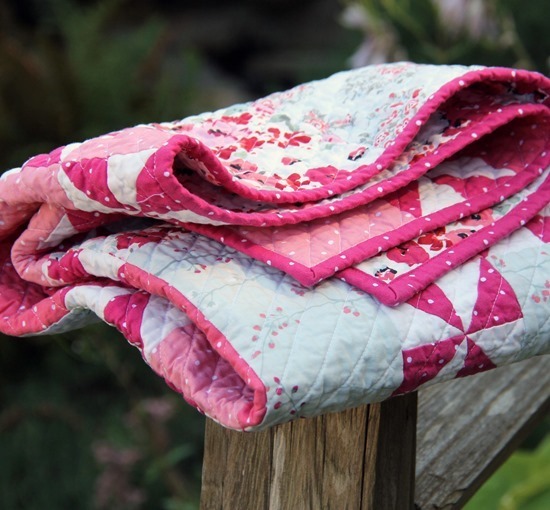 The quilt pattern is perfect to display these sweet fabrics. Awesome job! LOVE the quilt! Love the fabric! 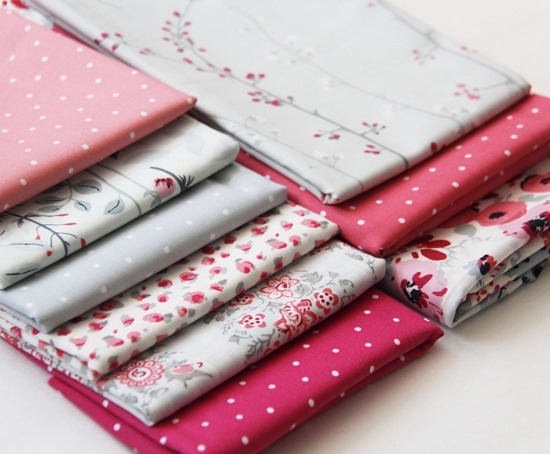 I'm not a fan of girly fabric either, but these really are pretty! This is such a lovely piece, i love the Fábric print and colours and the mix is so gorgeous. I'll have to see if my local quilt shop will get this line in. They usually do get in Dear Stella. Your pattern is perfect with it. Love the fabric it's romantic but yet modern! I'm sure it's recipient will love it! Hi, Allison! Love the pattern. As the owner of one of the "local" quilt shops in the country, I'd ask that your last line be "Look for these fabrics at your LOCAL QUILT SHOP -OR- order from … (the 2 you listed). We All carry your patterns whether we have that particular fabric or not. Keep up the good work! Oh they are gorgeous pinks – crushed strawberry and raspberry not super sugary pink – definitely irresistible! I want a big girl one just for me – these are BEAUTIFUL! I love these fabrics! I just bought the fat quarter bundle this week! These are fantastic fabrics! Love the gray with the pink. Love it! Agree about the gorgeous colours – not too sugary girly at all. Have bought your pattern and will order the fabrics. Definitely making this! Thank you! That is a very pretty quilt…so perfect.. I always LOVE the combination of grey and pink together. Looks great! Putting some in my shopping cart next! Love the fabrics. Congrats on a wonderful baby quilt. 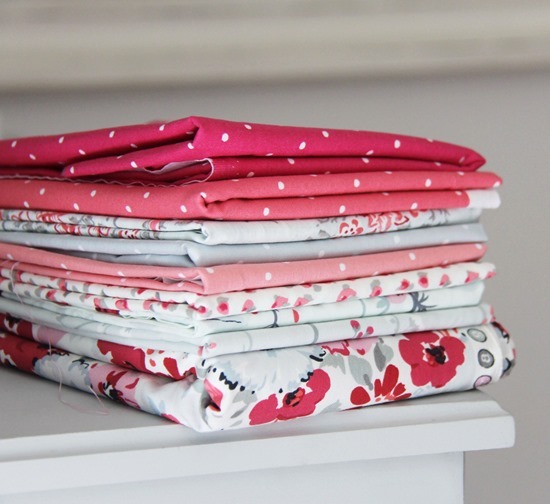 Your Playful pattern & the Flirt fabrics are perfect together! Great job – love it! Perfect fabrics for a wonderful pattern. Very, very nicely done. What a lovely way to use that beautiful fabric collection! Such a pretty quilt! The pattern and the fabric look great together. Very nice! I've been eyeing up that bundle but have managed to resist! Lovely quilt! I bought the fabric and the pattern , I was just wondering if I should wash the fabric before starting to piece or not! Anybody ? Is this pattern available now ?